Will Texas use the Hurricane Harvey attack to shut down geoengineering? It is the studied opinion of this Alt Media platform that the NWO globalist cabal that ordered the weather attack on Texas made a HUGE mistake. That gross error of judgment concerns both the timing and severity of their catastrophic superstorm invasion of East Texas via Hurricane Harvey. The American patriot movement has always been very strong throughout the “Lone Star State”. Likewise, the Trump movement counts “the Right” in Texas as its premier torchbearer. These no-nonsense patriots will not hesitate to pick up their “torches and pitchforks” when the time comes. Given this weeklong weather assault against the people of Texas, that time may very well be now. In light of this pivotal understanding, the following “open letter” serves as both a clarion call and rallying cry. The Great State of Texas has been brutally and stealthily stormed…by both illegal aliens and now calamitous rainfall. But the common folk have no idea yet of what has really happened to them. Hence, the purpose of this vital missive is to inform (and motivate to action) a critical mass of Texans (and supporters) of the true state of affairs. Only in this way will their state government be compelled to respond accordingly, and decisively. So, the silver lining in this dark cloud known as “Harvey” is just that: The very real prospect that the first state in the American Republic will take back its power from a shadow government that uses weather warfare and environmental terrorism to enforce its dictates. When the people of Texas are successful in this noble endeavor, the other states will quickly follow their lead. The Second American Revolution will have begun in earnest! N.B. Dear reader, the letter below was submitted for every single Texan to read. It wasn’t written for the Alt Media mavens or Alt Right adherents, as you will soon see. Yes, the alternative news websites are highly encouraged to post this important piece, knowing that the style and language were tailored by the authors to reach the widest audience possible. Thank you for disseminating this urgent call to action! We have watched you folks get hit with one storm after another over many years now. What a nice and benign name they gave it, didn’t they? What is really known about Hurricane Harvey anyway? It came out of nowhere and grew so fast most Texans could not grasp the reality quickly enough, or properly prepare. Most people don’t know, but this superstorm is now known on the Internet by some very interesting names. Isn’t that the way life is in 2017? Everything is illusory … everywhere … all the time. 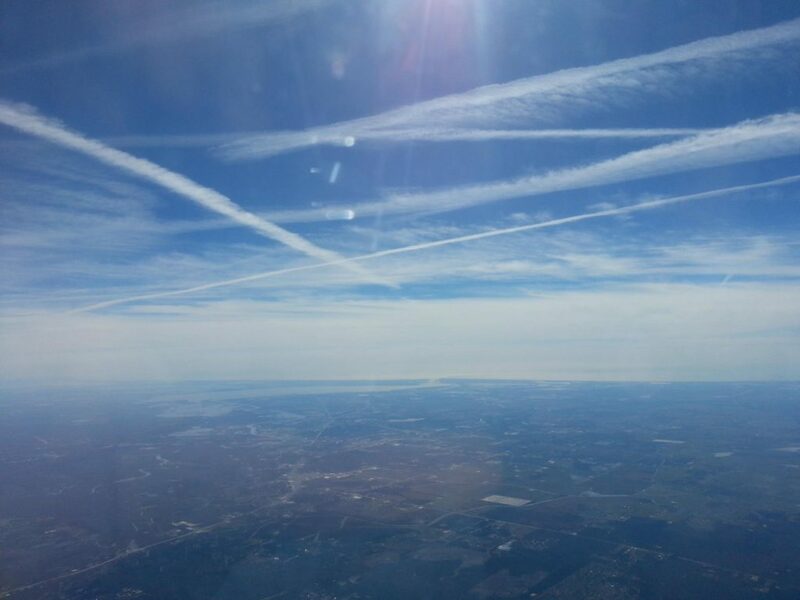 By the way, have you folks ever seen this little post on chemtrails? We think the pilot doing the whistleblowing is from Texas. What a guy! What a hero! Look it, we really respect your right to do whatever you want to about this latest storm. You guys (and gals) are famous for your true grit and independent thinking … … … and always going your own way. But can we offer one bit of advice. Find out how this thing — H A R V E Y — just suddenly appeared out of nowhere. Go do a little research. Check out the storm path … starting in the Atlantic, and then in the Caribbean. Just in case y’all don’t know, there’s a government program out there that they came up with to ‘fix’ the fake global warming scam. It’s conducted under the umbrella of geoengineering. This goes back to those chemtrails you see being sprayed all over Texas skies. Here’s a pic of these ‘trails spreading out over Houston. You may recognize the area shown below that is not far from Houston Hobby. Now you’re probably thinking that we are talking about some wild conspiracy or secret back story that the media won’t touch. And that these chemtrails are somehow related to Harvey. Well, the government has come right out and said many times that they’re doing geoengineering. Actually, what they said is that they do chemical geoengineering. Maybe it’s high time y’all found out what that is. Maybe do a little checking out of those mini-HAARP stations showing up all over the place. And pay a little closer attention to those chemtrails and chembursts and chemclouds overhead. The bottom line here is that when the geoengineers marry up chemtrails with HAARP, they can make babies with names like Harvey. You might recall the 3 baby girls they gave birth to in the summer of 2005—Katrina, Rita and Wilma. That was 12 years ago and, yes, only Hurricane Rita hit the state of Texas. However, your state has been pummeled by many a horrendous storm since then. The Austin area seems like it’s a magnet for the worst of these monster storms. Now just why is that? The capital city getting hammered so often? You folks have been under assault—BIG time for a long stretch now! The problem is: this situation is likely to get much worse, before it gets better. If you really want to know what the heck is going on here, you may want to check out the posts at this link: What in the world did they just do to Texas? Just one last piece of unsolicited advice for you brave souls. If ever the American people were given a stellar opportunity to stop the chemtrails, Harvey is it. You see, what the geoengineers did with Hurricane Harvey was very stupid. Those who gave the orders to fabricate and guide this superstorm over East Texas screwed up royally. Now everyone’s asking questions. Which is GREAT! They want to know exactly where this thing came from—out of nowhere…as if it was pieced together in some geoengineering laboratory, which it was. Now the good people in Texas can really get busy. After all, you’ve been downright devastated by a biblical flood. Y’all have plenty of reason to lead the nationwide charge against the whole misbegotten project. Especially to stop the destructive weather manipulation and dangerous climate engineering which now occur 24/7 across the land. Oh, and one final point, if any of your friends or family say those are all contrails up in the sky, just send them this: They’re chemtrails, not contrails, and these photos prove it. Our sincere prayers to the great people of Texas. P.S. Hey you, Texans. There’s a very good reason why you courageous Americans are practically the Chosen People of the 3rd Millennium. Clearly, y’all have the right stuff to get this job done like no one else on Earth. The good Lord always chooses those who can really rise to the occasion and meet the formidable challenges. That’s you! Through your collective sacrifices due to Harvey, the impetus is now there to take back your state from those who have geoengineered it. That will provide a glowing example for the other 49 states. So again, let’s get busy! It’s time to lead this nation out of the desert and back to the “Promised Land” fought for by the Founding Fathers.